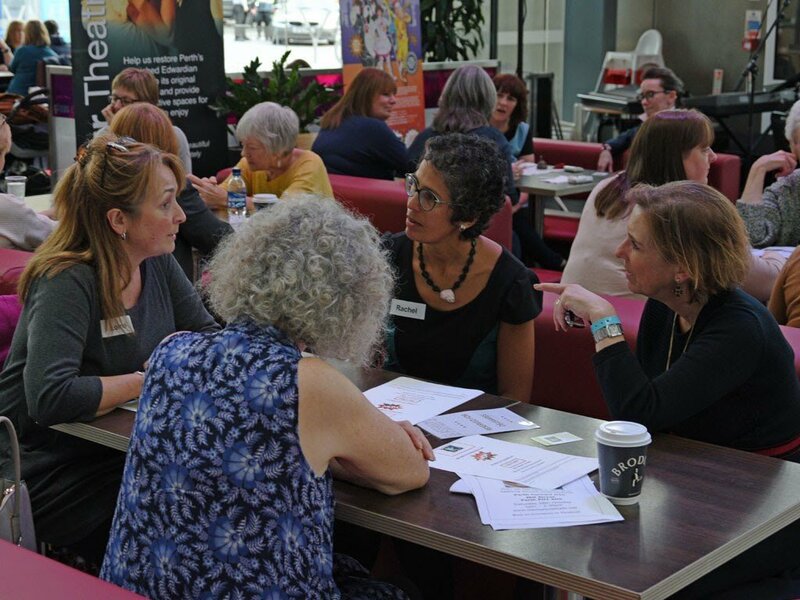 Find out about all the details of our Menopause Festival held in Perth here. See this website for an outline programme. Follow the more information link to book tickets. See this website for an outline programme. Follow the more information link to book tickets. 3 in 5 suffer at work due to menopause - that's why we are holding our "Menopause at Work" seminar at Perth Concert Hall and Perth Theatre - Horsecross tomorrow afternoon, aimed at employers, HR and trade unions. 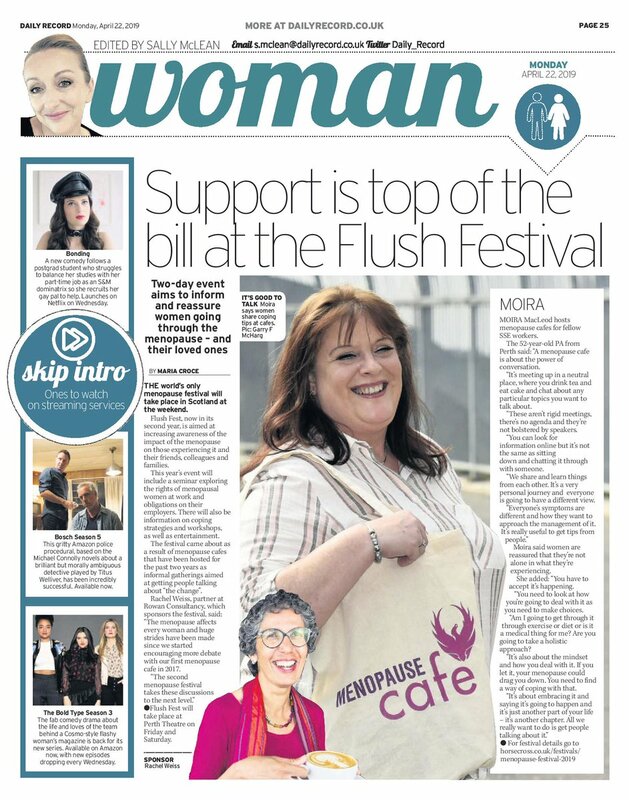 Moira, one of our wonderful volunteer committee members, was in the Daily Record yesterday, in their article on #FlushFest2019. Did you see it? We've only got this photo, would love to see the full article, so do send us a photo or link if you have one. It's going to be informative and fun at #FlushFest2019 next Friday and Saturday! Book your £15 Saturday day passes here (includes lunch!) or your Friday "Menopaue at Work" seminar ticket, or your film or comedy evening entertainment. For a hardy band of souls in Perth, there is nothing we would rather be doing than running around Perth City dressed in Santa suits. No, we are not mad. Okay, maybe just ever so slightly. But what we are is a dedicated group of 5 women, 1 man and his dog, aiming to raise funds to help the Menopause Café charity. Fancy hosting a Menopause Café? Have a wee look at our ‘how-to’ guide, send in your Working-Agreement and we’ll help you every step of the way. We have a copy of Julie’s book to give away at #FlushFest2019. Just book your ticket, turn up to @HorsecrossPerth and enter the free draw. Yup, it’s that simple. Debbie will be hosting a Menopause Café right after her show tonight, and it’s also her birthday. Now that’s dedication for you! 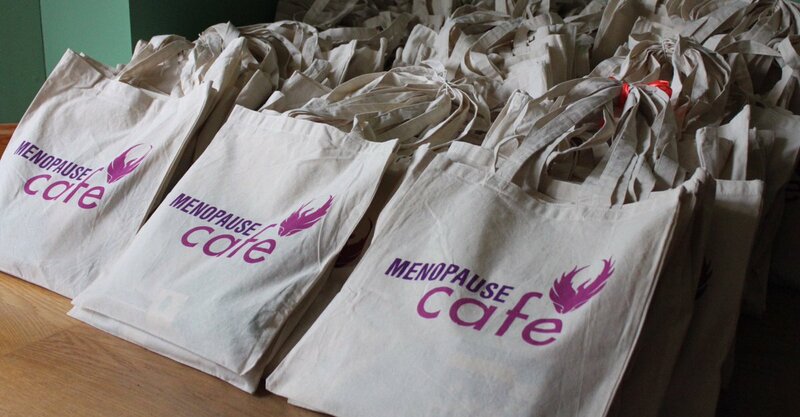 Want to sport a Menopause Café tote just like our very own Moira? Then book your tickets to #FlushFest2019 and join us at @HorsecrossPerth this coming Friday & Saturday.